Five ingredients is all that is needed to make easy peasy monkey bread. Sugar, cinnamon, brown sugar, melted butter and the ‘easy’ part, 2 cans (16 oz each) Pillsbury Grands! Homestyle refrigerated buttermilk biscuits. I’m not even sure where or when I acquired this recipe but I’ve been making it for as long as I can remember. This recipe is super fast and easy, that’s the ‘peasy’ part. Bubble Bread first began to appear in magazines in the 1950’s. Around the 1980’s bubble bread began appearing under the name ‘monkey bread.’ I’ve always known monkey bread as bubble bread but it seems that the name ‘monkey bread’ has stuck. I don’t ever hear it called bubble bread anymore, even though they are both basically made the same way. Whether you call it bubble bread or monkey bread one thing remains the same, it’s delicious. 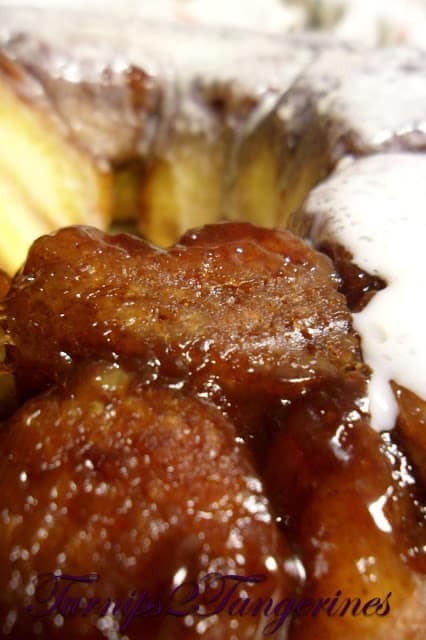 Monkey bread or bubble bread can be made sweet or savory, with the emphasis on sweet. The original recipes were always sweet versions vs savory. Both are tremendously delicious and relatively easy to make. For the sweet version, pieces of a yeast-sweet dough are rolled into balls. The balls are dipped in melted butter and rolled into a cinnamon/sugar mixture. The balls are then ‘staggered’ in a greased bundt and baked. Savory versions of bubble bread or monkey bread have become more and more popular over the years. The savory versions are often stuffed with cubes of cheese or pepperoni-style meats. Pieces of yeast dough are rolled into balls and then dipped into a mixture of melted garlic butter. The balls are then rolled into a herb/savory spice blend of some kind. The balls are ‘staggered’ in a greased bundt or tube pan and then baked. Whether sweet or savory, whether you call it bubble bread or monkey bread and whether you make it in a tube pan, bundt pan or a 13 x 9 baking dish, eating the bread is done in the same way. After baking, the pan is inverted onto a plate. This allows for all the gooey goodness to slowly drip down the sides and over the bread. Thus making the bread even more irresistible. Sections of the bread are then ‘pulled’ off and enjoyed! 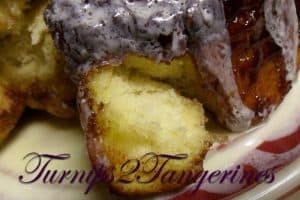 Monkey Bread or Bubble Bread is super delicious! Heat oven to 350º Grease a 12-cup Bundt pan. In a large plastic storage bag, mix sugar and cinnamon. Separate dough into 16 biscuits, cut each into quarters. Shake biscuit pieces, a few at a time, in bag with the sugar and cinnamon mixture. Toss to coat. Stagger pieces in pan. In small bowl, mix brown sugar and butter. Pour mixture over biscuit pieces in pan. Bake 28 to 32 minutes or until golden brown. Cool in pan 10 minutes. Turn upside on serving plate. Mix together confectioner's sugar, extract and milk until desired consistency. Drizzle over easy peasy monkey bread while still warm. Can you do this in a different pan? Love love this recipe. Will definitely try this one. Iam your newest follower via GFC! Hope you visit my blog too and follow back. This gives one a drooling problem, one being "moi"